Agarose for electrophoresis in gels has an excellent price and is ideal for use for analytical as well as preparative nucleic acid electrophoresis of DNA fragments from 50 bp to 50 kbp. 1. Pour buffer (approx. 90 % of final volume) into an appropriate flask that can accommodate up to four times the final gel volume and add a magnetic stir bar. 2. Put the flask with agarose onto a magnetic stirrer and slowly add agarose powder while stirring constantly to avoid clotting. 3. Remove flask magnetic stir bar. 4. Add remaining buffer up to the desired final volume. microwave heating, there may be a delay in the liquid boiling! 6. Using the microwave oven, heat in short bursts of 5 – 10 seconds or until the solution withj agarose is boiling, with breaks of 10 – 15 seconds between heating phases to disperse bubbles by gently swirling the flask. Beware of hot glass ware and liquid. Continue until the agarose is completely dissolved. 7. Again, weigh the flask and top up lost volume with warm, deionized water. Gently swirl the flask to ensure complete mixing of agarose and all components. 8. Let the solution cool down at room temperature for 15 – 20 minutes or until a gel temperature of 50 – 60 °C is reached. 2. Weigh and record the weight of the flask prior to heating. Heat agarose suspension up in a simmering water bath with constant stirring. 3. Leave the flask of agarose and all components bath in the water for further 15 – 20 minutes, or until the agarose is completely dissolved. 4. 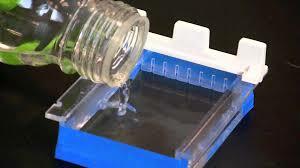 Switch off the magnetic stirrer and leave the flask with agarose in the bath for further 15 minutes. 5. Again, weigh the flask and top up lost volume with warm, deionized water. Gently swirl the flask to ensure complete mixing of agarose and all components. 6. 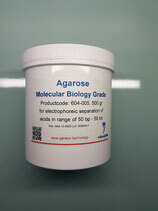 Let the solution of agarose cool down at room temperature for 15 – 20 minutes or until a gel temperature of 50 – 60 °C is reached. 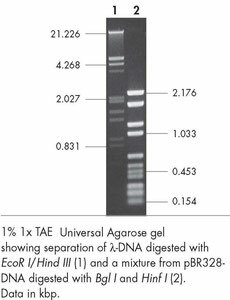 Universal Agarose for gel-electrophoresis and an excellent price is ideal for analytical as well as preparative nucleic acid electrophoresis of fragments from 50 bp to 50 kbp. Even at low concentrations the gel produced is very firm. Agarose gel electrophoresis separates DNA fragments according to their size. 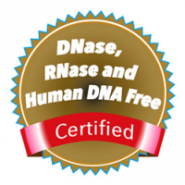 Typically, a DNA molecule is digested with restriction enzymes, and the agarose gel electrophoresis is used as a diagnostic tool to visualize the fragments.